The Persistence Market Research report on the global tea concentrates market studies the prospects in the market and presents updates and insights pertaining to various segments of the global tea concentrate market over the forecast period 2018–2028. This report offers actual data of 2017 along with estimated data of 2018, and forecast data up to 2028 in terms of revenue (US$ Mn) and volume (MT). It provides forecast and analysis of the global tea concentrates market. The report covers macroeconomic indicators along with an outlook on tea concentrates for the global market. The report also contains a share of top tea producing countries in the world, export/import volume and value of tea concentrate of top exporting and importing countries, and industry value chain analysis. The study encompasses market attractiveness analysis by product type, end use, and region. Product type segmentation divides the global tea concentrates market into black tea, green tea, and others. It includes drivers and restraints of the global tea concentrate market and their impact on each region during the forecast period. The report also includes ongoing trends and market opportunities for tea concentrate producers in end-use industries such as food service and household. In order to provide users of this report with a complete view of the market, we have included detailed competitive analysis and competition deep dive of companies which are engaged in the business of tea concentrates. The report comprises information related to key players in the tea concentrates market, their strategic overview, and recent developments in their business areas. The report also includes types and forms of tea concentrates offered by key players across North America, Europe, Asia Pacific, Middle East, and Africa. Tea concentrates market participants include PepsiCo, Inc., Tata Global Beverages Ltd, A. Holliday & Company Inc., H&H Products Company, Cooper Tea Company LLC, Maya Tea Company, MB-Holding GmbH & Co. KG, Monin, Inc., Herbalife International of America, Inc., Synergy Flavors, Inc., Amelia Bay, ThirsTea Corp, Island Rose Gourmet Tea, The Chai Direct, and RFI Ingredients. The data analysis for the global tea concentrates market is estimated in terms of value and volume consumption. To arrive at the volume consumption of tea concentrates, production data of countries producing tea across the globe have been taken into consideration. In addition, the production of tea concentrate varieties is tracked and further, their import-export in the global market is tracked for understanding the consumption in key countries. The market analysis for organic vs. conventional growth of tea is derived for further understanding the share of tea concentrate market in overall tea production. Furthermore, Persistence Market Research estimated volume data on consumption of tea concentrates for several countries by understanding the demand and supply of tea concentrates. It includes production, growth, volume and value sales, transition, pricing, per capita consumption, population, consumer preference, and consumption of tea concentrates among end-user verticals. PMR determined the volume consumption of tea concentrates across various regions including North America, Latin America, Asia Pacific, and the Middle East and Africa. Forecasting is done on an internal proprietary model using different macro-economic, industry-based demand driving factors impacting the market, and its forecast trends by identifying and allocating a weighted score to forecast factors that influence the demand for tea concentrates. These factors were the representative of an entire value chain, as well as the macro-economic indicators such as production, per capita consumption of tea concentrate, per capita spending on food products have been taken into consideration to arrive at the volume consumption of tea concentrates in respective countries. The weighted average selling price for tea concentrates was considered to estimate the market size for top tea concentrates consuming countries. These prices were captured in their respective countries and then converted into USD to offer forecast in one consistent currency standard. Given the characteristics of the market, PMR triangulated the data based on supply side, demand side, and dynamics of the global tea concentrates market. To develop the global tea concentrates market forecast, PMR analyzed various factors to understand their respective impact on the target market. It is imperative to note that in an ever-fluctuating economy, we not only provide forecast in terms of CAGR, but also analyze the market on the basis of key parameters, such as year-on-year (Y-o-Y) growth, to understand predictability of the market and identify the right opportunities. Another key feature of this report is an analysis of the global tea concentrates market and the corresponding revenue forecast in terms of absolute dollar opportunity. To understand key segments in terms of their growth and performance in the global tea concentrates market, Persistence Market Research has also presented a market attractiveness index. The resulting index should help providers identify existing market opportunities in the global tea concentrates market. The report covers an in-depth analysis of all components of the value chain in the global tea concentrates market. In the final section of the report on the global tea concentrates market, the competitive landscape is included to provide a dashboard view of global tea concentrates manufacturers. Persistence Market Research gives ten years forecast for the global tea concentrates market from 2018 to 2028. 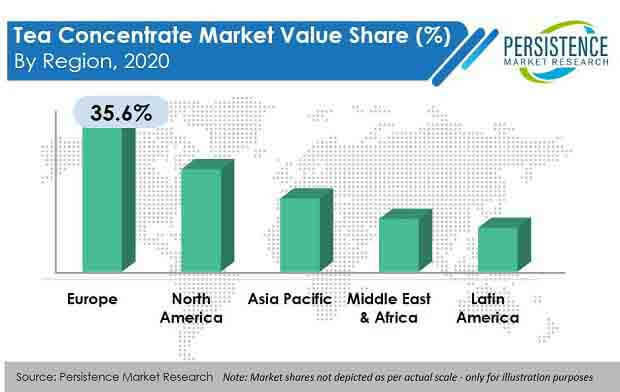 According to the recently published report from Persistence Market Research, the global tea concentrates market is expected to register a CAGR of 4.1 % during the forecasted period. Tea concentrates are extracted from tea leaves. These are more preferred by the food industry rather than households. Tea concentrate is basically a double-strength brew that dilutes with boiling water or any diluents and serves as a ready-to-drink beverage. There are many different flavors in which these tea concentrates are available. Flavored tea concentrates are made by blending tea leaves with other spices such as cinnamon, ginger, and berries. Fast food culture is growing across the globe and the demand from the fast food industry has a positive impact on tea concentrates. Each fast food restaurant provides beverages. Multiple fast food giants already offer tea beverages as a part of their menu, this includes global fast food and beverage giants like McDonald’s, Starbucks, and Taco Bell among others. This growing fast food culture directly affects the tea concentrate demand in a positive way. The constant innovations in the tea market increase demand for tea concentrates. There are a variety of innovations made by tea manufacturing companies to cater to the needs of consumers. Tea is a widely consumed beverage, and its processing produces many value-added products which include tea bags, instant tea, tea concentrates, packet tea, flavored tea, decaffeinated tea, fortified tea, tonic tea, tea cider, tea Kombucha, iced tea, and herbal tea. Nowadays consumers are bold, adventurous, and curious. Consumers want sensorial experiences that are innovative. Tea concentrates achieve that by providing flavor fusions that they wouldn’t otherwise be able to recreate at home. Tea concentrates also provide ease of storage, transport, and versatility. Tea concentrates are products derived from concentrated tea extracts which can be diluted in water. They are available in solid and liquid form in the market. These tea concentrates are available in different flavors. They are used to make hot, as well as cold beverages. For many beverages, tea concentrates are used. Instant and iced teas use different flavors of tea concentrates. Under health beverage section tea is consider as healthy drink. There are some tea concentrates which contains herbal flavors. Green tea is one of the best drinks used by the people those are concern about health. Adding green tea in daily consumption is beneficial for health and skin. It contains antioxidants which are beneficial for health and skin. These benefits of green tea drive the market for tea concentrates for green tea segmentation. Tea concentrate prices are higher than tea products since qualitatively they have much higher tea content. This puts tea concentrates in a premium price point wherein the consumers from developing/ underdeveloped countries don’t make a purchase decision based on convenience, but rather economic feasibility of the product. The Asia Pacific is the single largest region with a strong affinity towards tea and tea-related beverages in general. However, more than 3/4th of the population prefers traditional tea making practices than purchasing tea concentrates. This can be associated with the cultural development, the price difference or just the ease of availability of the native form of tea in the region since the region is also the producer of the finest tea leaves in the world. This results in the product missing out on the largest potential consumer base due to its high prize. This report discusses key opportunities and drivers which contribute towards the growth of the tea concentrates market. The report discusses key manufactures of tea concentrates in the global market. Detail profiles with strategies and developments of competitors are also provided in the report. Key product offerings, as well as long term and short term strategies by manufacturers, are provided in the report which help to understand the overall global market for tea concentrates. Tea concentrates key players include PepsiCo, Inc., Tata Global Beverages Ltd, A. Holliday & Company Inc., H&H Products Company, Cooper Tea Company LLC, Maya Tea Company, MB-Holding GmbH & Co. KG, Monin, Inc., Herbalife International of America, Inc., Synergy Flavors, Inc., Amelia Bay, ThirsTea Corp, Island Rose Gourmet Tea, The Chai Direct, and RFI Ingredients.